Removed the nasty ad! Or yellow snow again…. Bloody hell… Why did nobody tell me that there was a nasty Ad on the site which was trying to install something, spawning windows, playing sounds etc? I’ve discovered that by an accident! Firefox for UNIX silently blocks all the crap, but Explorer for Windows was shouting madly. So, the ad was from company called “Pay-Ads”. Don’t use it. And don’t use Internet Explorer. And don’t use windows. 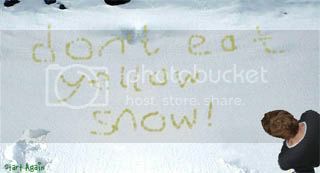 And don’t eat that yellow snow! I use Windows AND Firefox (and ‘adblock plus’ add-on) and very rarely see ads! I also use Adblock + black list on proxy, but since some time ago, I began to click from time to time on ads placed on the sites I like to support them. You may have noticed, that the last time I was mostly busy with ad campaigns than with the actual content. No fun, plain annoyance, I know, but since donating does not work, ads is the only way. – The Wikipedia links pointing to my site were labeled as dangerous because of the Trojan. And this is not funny but quite embarrassing. So my question “why didn’t you tell me” is for those who found some time and made some efforts to update Wiki, but didn’t drop me a single line. What the heck is Yellow Snow? Oh, must confess, I should have paid more attention to the Guestbook. TiedLaura mentioned helluva ads on Nov 24. But I haven’t seen her message until today because I was looking at the old cached page. Please take a look and thanks for your feedback.